Recently, I did a photo shoot for my brother and sister-n-law’s new baby girl, Taylor. She is a newborn right now, but will soon grow up like her big brother. I remember when their son, Taylor’s brother, was born two years ago. As we looked back over his baby pictures it was hard to believe he has grown so much in the last two years. He has progressed from being fully dependent on mom and dad for everything to being able to walk, talk, and play. It is during these formable years that parents need to start actively teaching their children about their sinful hearts and need of a Savior. In order to help parents in the shepherding process, I am recommending a book. 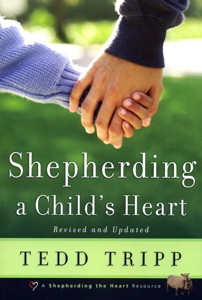 It is Shepherding a Child’s Heart by Tedd Tripp. In order to help parents shape their child’s life in a way that pleases God, Tripp offers a plethora of advice. He begins by helping parents understand the outside influences that shape their child’s life (10-16), while at the same time explaining to parents that changing these influences alone will not produce a more godly child (16-25). Before continuing with the child’s heart, Tripp turns toward the parent, helping them better understand their task by informing them of their God given authority (26-38), and by calling them to examine and rework their parenting goals (39-57). Tripp also takes the time to point out unbiblical parenting methods, such as pop psychology and emotionalism to name a few, and help parents evaluate the use of these methods from a biblical standpoint (58-69). Tripp then walks parents through biblical methods of parenting, explaining the importance and how to of communication, discipline, and appealing to the conscience (70-121). He shows parents how to shepherd through each stage of childhood by alternating between training objectives and procedures (127-210). If you are looking for a book that seeks to address the condition of your child’s heart, then Tripp’s book is for you. His reasoning and methods are thoroughly grounded in Scripture. And he does a fantastic job teaching parents that behavior modification is not the ultimate goal. Rather, a changed heart through the saving and sanctifying power of the Gospel is the main goal parents should be working to achieve. I would recommend Tripp’s book to any parent seeking to learn how to shepherd their child from a biblical standpoint, which should be each and every parent.